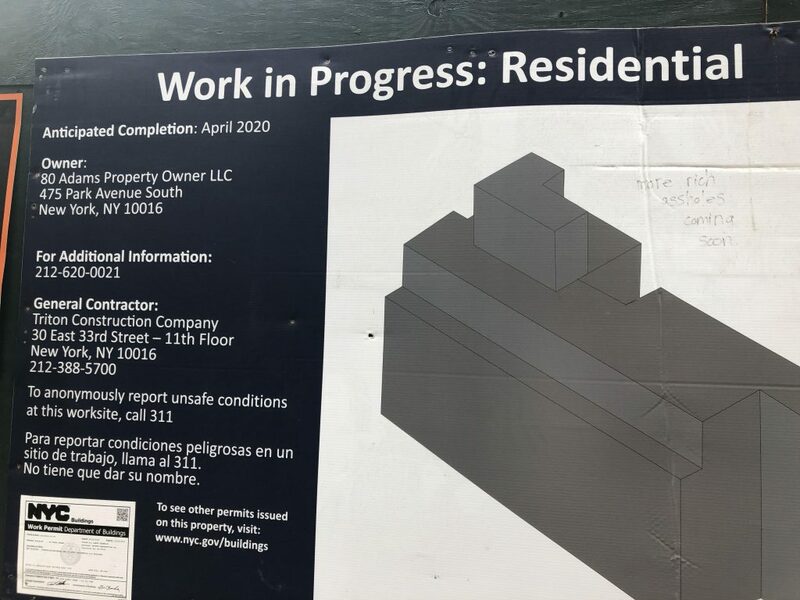 A tipster’s photos of the impending 10-story residential project at 80 Adams Street in Dumbo, Brooklyn shows progress on the foundations, which are now being poured and laid with concrete and rebar. 165 units will occupy a site that previously featured a Jehovah’s Witness parking garage. The site was bought for around $60 million and is currently owned by Jeffrey Gershon of Hope Street Capital. 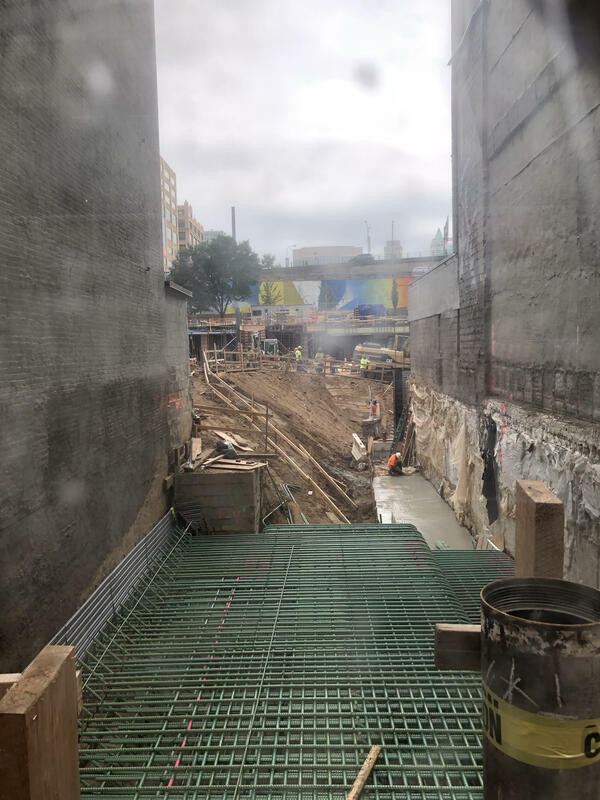 ODA is the designer of the new building, which will eventually rise 120 feet above the streets below, and contain nearly 186,000 square feet of interior space. Triton Construction Company is the general contractor. 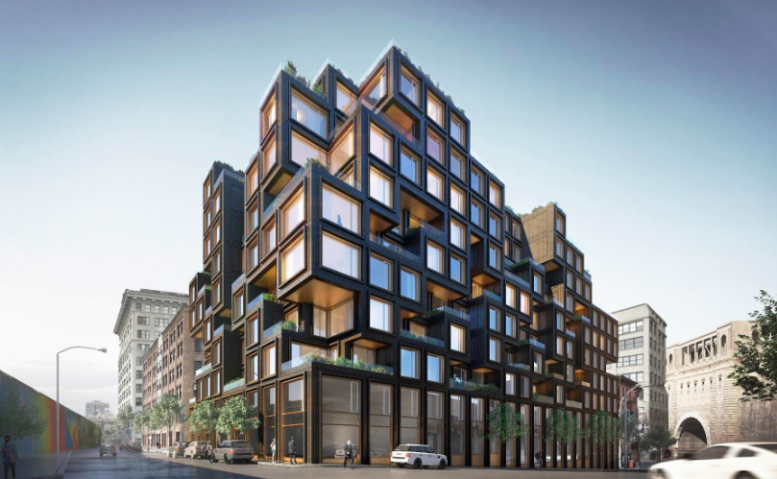 The exterior will encompass a mix of multiple outdoor spaces within the voids of a grid of stacked boxes that form each of the 120 units. There are portions of the building that are cantilevered and set back. Windows will perforate the dark-colored structure, while shrubs and landscaping will sit within the outdoor terraces and roof deck above. Inside, each floor will house between nine to fourteen units each. Amenities include a swimming pool, a recreation room for all ages, a roof deck overlooking the Lower Manhattan Skyline, and underground parking with 66 spaces. Although not as tall as a typical New York City skyscraper, the architecture of the exterior should ensure it stands out among the surrounding landscape. The new structure sits between the Brooklyn and Manhattan Bridge at the northwest corner of York Street and Adams Street, with Fleet Alley separating the site from the adjacent brownstone buildings to the west. The York Street and High Street-Brooklyn Bridge subway stops are within walking distance while the East River waterfront and Brooklyn Bridge Park are all less than two minutes away by foot to the north. Shopping and dining options are also abundant in the neighborhood. Completion of the project is expected in April 2020. 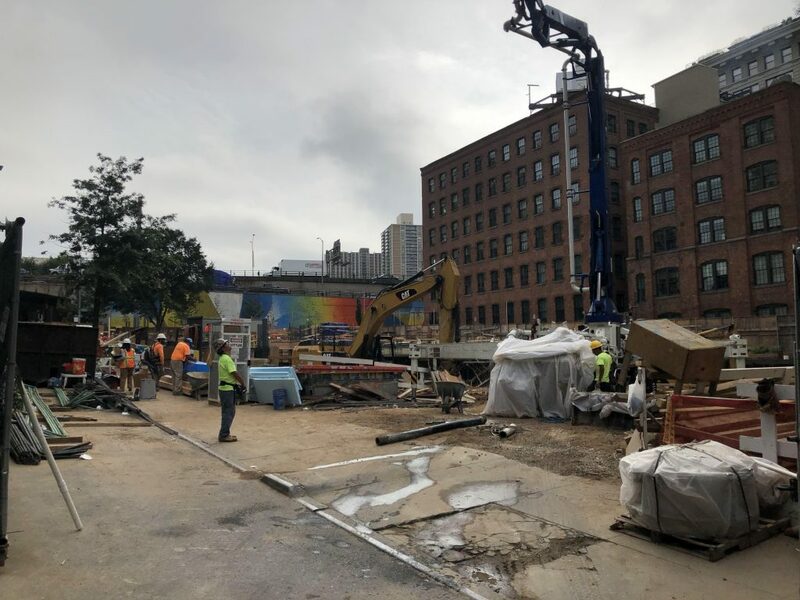 1 Comment on "Foundation Work and Concrete Pouring Underway at 80 Adams Street in Dumbo, Brooklyn"